CreditCardProcessing.com is part of the Wells Fargo family of financial service providers, through its iPayment ISO. This business is actually a reseller that works with merchants to collect credit card payments, while iPayment or Wells Fargo does the actual transaction processing. Their focus is on an extremely knowledgeable in-house sales staff, that acts more like a traditional sales relationship than most other companies in the industry. When a client calls CreditCardProcessing.com, they speak to the same dedicated salesperson who assisted them in signing up. 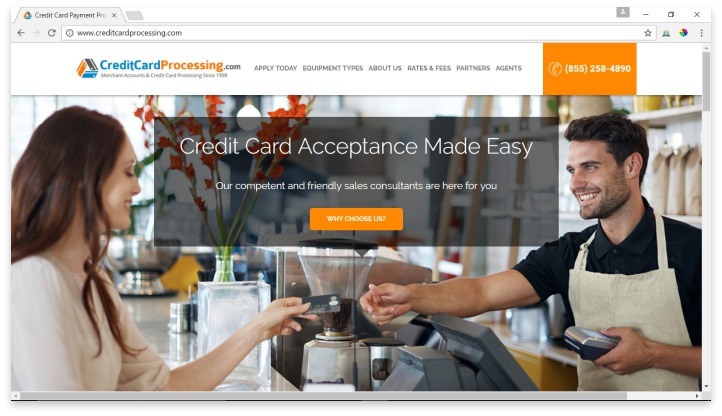 Creditcardprocessing.com serves over 150,000 customers, including food service locations, e-Commerce businesses, phone or mail order businesses, and other merchants that need wireless payment processing technology so they can accept payments from a phone or tablet. One of the first great things about CreditCardProcessing.com that draws a lot of attention is their policy on contracts and cancellation fees: they don’t have any. All agreements are on a month-to-month basis, which is perfect for businesses still learning what works for them in credit card processing. Anyone who has been burned by hefty fees to get out of a contract before knows how frustrating it can be to choose between your budget and getting great service. CreditCardProcessing.com also has the one of the highest approval ratings in the industry; high-risk businesses, or business owners with less than stellar credit, might want to begin their search here, rather than with stricter companies. Their monthly fees aren’t the most affordable on the market, but they are still fairly affordable, at approximately $15 in standard monthly fees, along with two fees that total approximately $45 per month can be waived if the customer takes a survey and does more than $2,500 in credit card business per month. Annual fees through CreditCardProcessing.com are standard, and they offer a price match incentive if you can find another credit card processor with similar services. Their customer service is really where CreditCardProcessing.com shines. They have the ability to get you started within a day, meaning your credit card processing could start as soon as the next day. Everything is handled via the phone or email, however; there is no live chat option for those who prefer that method. CreditCardProcessing.com is a great choice for merchants who want the basics at an affordable price, and who appreciate having a dedicated sales representative that is with them every step of the way. CreditCardProcessing.com is truly only best for businesses that will do more than $2,500 in credit card sales per month. Any lower than that, and the additional monthly fees will make this service more expensive than similar options. And while they do offer the mobile sales tools, their terminals are average as far as technology goes. Overall, it’s a great choice for merchants who want the basics at an affordable price, and who appreciate having a dedicated sales representative that is with them every step of the way. Have you had an experience with this company? Please share your CreditCardProcessing.com reviews below.